Will my dog remember me after a month? 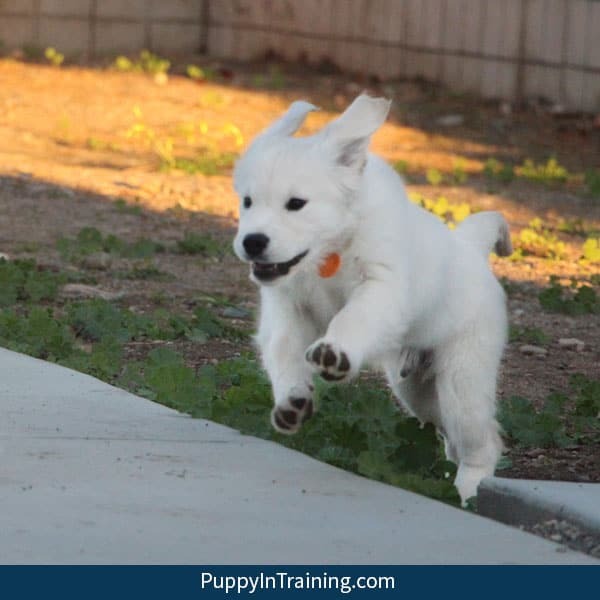 …It’s time to turn your service dog puppy in for formal training A.K.A. “Service Dog College”. As you hand your leash over to his new trainer it flashes in your mind…will my dog remember me after a month? a year? That was me yesterday. I handed Charlie’s leash over to Sharon from Cascade Service Dogs, we took a few pictures, I told Charlie to do good, and I waved goodbye. QUICK TIP: We like to keep something that reminds us of our puppy. If you’re a puppy raiser and sending your pup off to college then you might keep their pet tags and favorite collar (we pretty basic with our nylon buckle collar, but you can find some great custom collars on places like etsy) like we do and make sure to snap a few farewell photos with your smart phone. In my experience, the short answer: YES! Your dog will definitely remember you. As I mentioned earlier after raising a puppy for 12-18 months, puppy raisers have to return their puppies to school for formal training. Puppy raisers may not see their puppies again for 6-12 months, sometimes even longer. 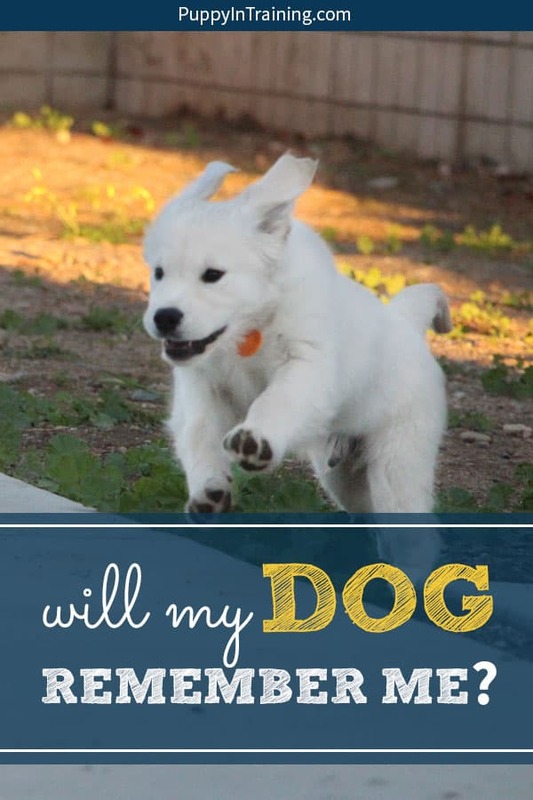 These are my stories as a service dog puppy raiser and the long answer to: Will my dog remember me after a month? a year? Let’s start off with my first guide dog puppy, Stetson. I picked up Stetson from Guide Dogs of America (GDA) as a 10 lb, 7 1/2 week old puppy. One word describes him: ADORABLE! Since day one Stetson was attached to my hip. We had adventures to Disneyland, train rides, Knott’s Berry Farm, movie theaters, shopping malls, you name it we did it. When he turned 16 months old GDA called to let me know it was time for Stetson to start Guide Dog College. Not every puppy in training makes it as a guide dog and after 2 months of formal training I got the call that Stetson was going to be career changed (the nice way of saying he was being dropped). Would Stetson remember me after being away for 2 months? An emphatic YES! I remember walking into kennel area waiting for the techs to bring Stetson out for our reunion. They came out with three very similar looking black Labs, possibly two of Stetson’s siblings. One of the three charged towards me with unbridled enthusiasm and I knew Stetson didn’t forget me. Will My Dog Remember Me After A Year? Do you guys remember Dublin? He was my third puppy in training and my first guide dog graduate. We documented a good chunk of Dublin’s journey to become a guide dog on our blog and YouTube Channel. If you ever wondered if a puppy will remember you after 6 months or longer then check out the 2:30 mark in Dublin’s graduation video. It was a special day. Dublin remembered me! We’re lucky and get to visit Dublin once a year in Arizona when we play in AZ Memorial Day weekend hockey tournament. And the answer to the question: Will my dog remember me after a year? Without a question Dublin always remembers me. In fact I try to get sneaky sometimes when we go see Dublin. After not seeing him for over a year we met up with his family at my hockey game, but instead of greeting him right away I stood about 20 feet away talking with a group of friends keeping a watchful eye on Dublin. Meanwhile I see his ears perk up and his head spin around. He either heard my voice or caught my scent. Immediately he went from the well behaved guide dog to an enthusiastic puppy again as he encouraged his partner to come say hi to his old puppy raiser. That brings us back to Charlie. His story is a little different then Stetson and Dublin’s. Stetson and Dublin didn’t come to our home until they were 7-8 weeks old, but they both stayed with us for well over a year. We helped Raven whelp Charlie who was puppy #8 in Raven’s second litter of Golden Retriever pups so we’ve had him since day 1. We only had Charlie for 14 weeks before he moved on to Cascade Service Dogs. Now that’s a much shorter period of time then the 1+ year we had Stetson and Dublin. Will my puppy, Charlie remember me? Hopefully we’ll have the answer to that question in 2019. 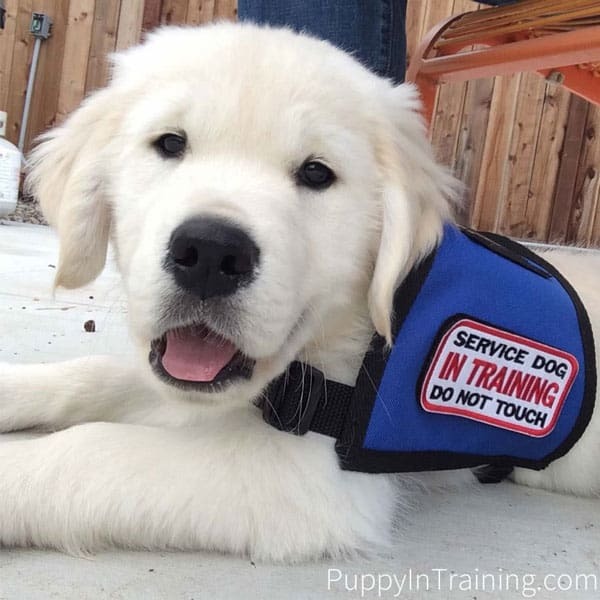 Charlie, Service Dog Puppy In Training! Every situation is different so I can’t attest for the memory and reaction of every dog just my own experiences. If you look up “dog reunion” on YouTube you’ll see some different reactions from dog’s seeing their human’s weeks, months, years, later. Dog is hesitant at first – Not all dogs recognize their humans at first sniff. Dog is so happy she’s crying – I love Golden Retrievers! Dog goes crazy when seeing his owner after 3 years – Dog’s are the best! Maybe we’ll do a reunion video with Charlie or even with Archer who we haven’t seen in over a year. Have you ever had to leave your dog for an extended period of time? Did your dog remember you? What was his reaction when he saw you for the first time in months/years? Snuggle Puppy – Charlie’s Fav. Jolly Ball – Adelle’s Fav. Bully Sticks! The dog’s love them! Favorite Blanket – First we wash the blanket then we rub it on our dog’s (Stetson, Raven, and Linus) before sending it off. A simple fleece blankets works great. Tell us your story in the comment section below. We’ll report back with Charlie and hopefully Archer’s reaction in 2019. Well, I was looking for something to help me with the ‘blues’ I am feeling over boarding our 15 month old AussieDoodle for four weeks for training. I have had dogs most of my life, but this dog was the first in 20 years. She is a ‘velcro’ dog, especially with me…if I take a step, she normally will take a step…working out upstairs, she stays up there while I am exercising. She goes with me to the recycle center, or picking up something to eat, etc. She sleeps right outside our door, or gets up in the bed to sleep with us at times. She is very timid and fearful, which is one of the areas we are hoping to improve with her training. I think I am thinking in human terms, which dogs do not do on a deep level. I think sometimes I feel it is my job to protect her when she gets fearful, but the trainer (25 years, thousands of pets trained…retired K9 handler as well) says I am likely reinforcing those behaviors, because I am treating her more like a child than a dog. I realize on an intelligence level, he is right, but my heart is not in the same place. Your AussieDoodle sounds a lot like my Linus. He was an Aussie mix and always wanted to be by my side. One thing I did with Linus that was very helpful was I got him used to staying with my parents and one of my close friends. He was comfortable staying at those two places when we had to go away. I know what your feeling as you said I know he’s a dog, but he really was like my child/best buddy.